Canyon view looking north towards Mt Lassen and from whence we came. Poison oak, the thru-hiker bane of low-elevation northern CA stretches. Looking forward to not seeing this plant again. With ice on board, Huckleberry and I made our way through Belden Town towards the trail. As we left the road, I admitted to Huckleberry that the 7# bag of ice was the best purchase we made and she wholeheartedly agreed. Cautiously optimistic that it would keep us from melting, we set out across the railroad tracks and immediately starting up a long series of switchbacks. We had to climb 4000' of vert over just under 6 miles to our intended campsite. Switchbacks in general are not a bad thing. 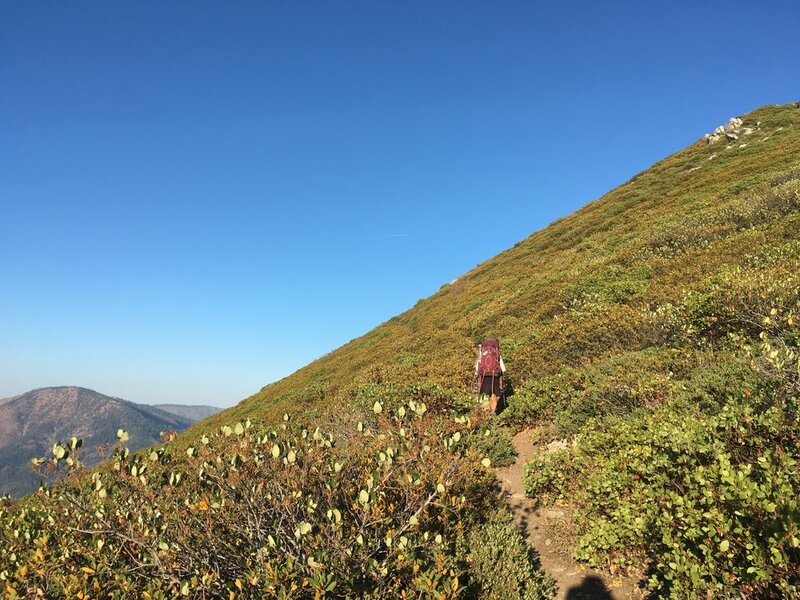 They help a trail to ascend quickly over a short distance without too steep of a slope on the trail itself, but depending on the surrounding conditions they can be a boon or a bane. That afternoon, they were most definitely a bane. We were starting out already hot and tired, and here the ice really helped. On top of that, we were starting from a low elevation, with poison oak lining the trail for the first few miles. Thirdly, those little flies that buzz around our faces (Huckleberry calls them terrorists) not only didn't let up, but seemed much worse on this side of the river. Huckleberry wore her headnet for the entire ascent and I was even tempted to break mine out in self-defense. So here we were, climbing 4000' of vert over 6 miles at the end of our day. Although there was shade from the canopy of Bay laurel (first we have seen since leaving home), oaks and Douglas firs, we still had a plethora of negatives stacked against us. It was a long grind up that hill. Our reward for the grind up from the north fork of the Feather River. Gorgeous granitic features and ridgelines. Huckleberry enjoying the open slope and our view of the red peak below to our left. Once we reached the last section of climbing, we found an awesome reward. The hillsides were covered in granite outcroppings with only manzanita on the slope above and the surrounding slopes. The wind picked up and the combination of higher elevation and air movement abolished the terrorists. We had fantastic views of the canyons below us in both directions. It made that slog up the hill so worth it. Rejuvenated by the views, we made good progress towards Canyon View Spring, the best reported water source around. As we took the side trail down to it, we saw Pitbull heading up slope ahead of us and from the footprints in the dusty trail it looked as though he had stopped in for water, too. Near the piped spring we had a grand dinner with sunset view. Per our new routine, we continued up the slope from twilight to night guided by headlamp and moonlight the final mile and a half. Our camp that night was on a saddle with more grand views, nestled on decomposed granite and surrounded by manzanita. This transition to granitic rock on the slope of Three Lake Mountain in the Bucks Lake Wilderness was a teaser of the Sierra Nevada to come and we were quite happy to find it after our low elevation foray this afternoon. All that night a cool wind blew across our tent reminding us that the weather was changing. Sunrise from the Three Lakes Saddle. A great way to start our day! Early autumnal colors on ridges. Letting us know that we will have more cool nights ahead. Silver Lake looking idyllic from our ridge top traverse. Day 68 started out with a chill. As I made brekkie n the pre-dawn drakness, I was very happy to be toasty warm. We then had a fabulous dawn, with the sky and canyons taking changing pastel hues as we enjoyed brekkie and broke camp. With an eye on a destination 30 miles distant, the middle fork of the Feather River, we started early to make the most of the shortening daylight. We were marveling at our granite and manzanita vistas when we turned a corner and our surroundings changed to a mature forest of Douglas firs and bracken fern almost instantly. We traversed through this forest crossing several streams and meadows. Mid-morning we even heard the familiar clanging of cowbells, though we didn't see any cows. 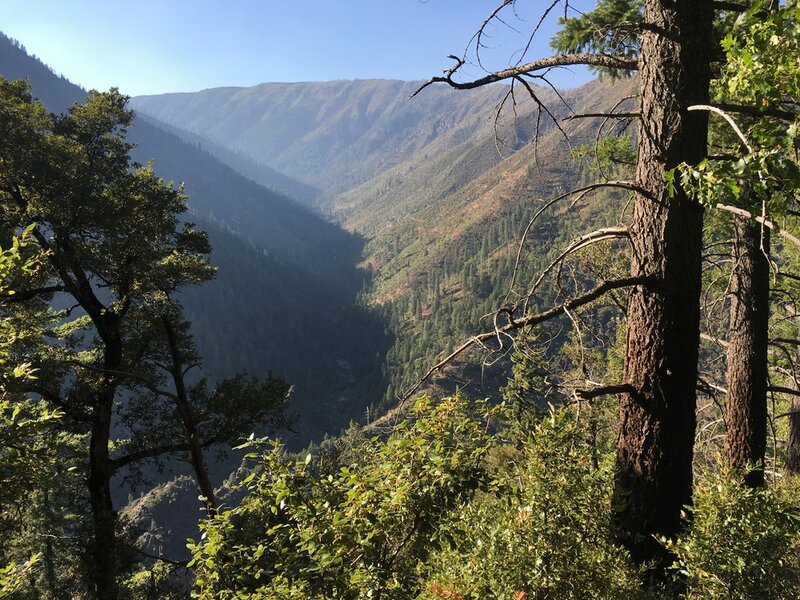 We did have some teasing views of granite slopes, alpine lakes and early autumn foliage changes, but after quick visits to the rim the trail would take us back into the forest. There were a few spots in the Bucks Lake Wilderness that we'd love to explore more on a future trip, and will probably return. We made steady progress throughout the day and continued through long sections of open forest of mixed conifers but primarily Douglas fir with little undergrowth. In the late afternoon, we started our descent into towards the middle fork of the Feather River. It could not be any more different from the north fork. The North Fork has been heavily altered due to human activity. First there was gold mining, now there is a major highway and a PG&E power plant that discharges water into the mouth of Yellow Creek and alters the flow of the river. In contrast, the middle fork has been designated as wild and scenic. When we crossed it on a high bridge the following morning, it was flowing freely and the canyon walls surrounding it were just gorgeous. Where the middle fork was peaceful, serene and majestic, the north fork looked like the outflow of an industrial plant. Heading down to the middle fork of the Feather River, a much more pleasant experience than down to the north fork. One of the numerous side creeks along the trail to the middle fork. We arrived at the middle fork at night, reminiscent of our approach to the McCloud River a week or so ago. Once again we saw a headlamp near the river but this time there was just one person camping and it was Pitbull. The path to the campsite was rather circuitous and he graciously guided us in. We all chatted for a bit as we made dinner, and we invited him to join us at the Quincy-LaPorte Road tomorrow for some fresh food when Huckleberry's mom meets us with our resupply. In the morning on Day 69 we all hit the trail at 6am and decided to hike together for a bit. Talking and hiking, the climb out of the canyon flew by and even after it got light the miles clicked away. Although we knew of each other from mutual trail acquaintances prior to meeting briefly in Belden Town, this was the first time we had spent together. Going through SOBOs we knew in common made me realize how much our little hiking community is like a traditional village. It's just big enough that we don't necessarily know everyone individually, but it's small enough that we know enough people in common to know something about most everybody. A more modern take would be 6 degrees of separation. The rest of the 15-mile morning passed quickly as we talked about our backgrounds, hobbies, interests, and of course our fellow SOBOs. Smoke rising on the horizon from the fire near Huckleberry's parents home. Fortunately, they were out of harms way. Everyone (Pitbull, Huckleberry's feet, Macro) enjoying the veggie pie on a thru-hiker table aka the ground. We arrived at the rendezvous point where the PCT crosses the Quincy-LaPorte road a little early and we each settled into some various tasks. Pitbull started a book that he had picked up out of the trail magic library we had all passed the day before (side note: the trail crossed a zillion dirt roads in this section, and at one point, we came across a large plastic bin filled with books, a "thru-hiker sharing library" that some literary trail angel had set up), Huckleberry started a blog post, and I caught up on my journal. Huckleberry's mum arrived with a feast fit for thru-hikers at the appointed time. She had stopped in Quincy for pizza, and seeing us all sitting on the ground in the trailhead parking lot she plopped the box right down on the dirt between us. I don't think I've ever enjoyed a pizza so much, and it didn't last long between the three of us. There were also fresh peaches, pears from their tree, nectarines grown by a neighbor, apples and grapes, yogurt, homemade chocolate chip cookies, ice cold water and two Black Butte Porters that we had not been able to finish during our zero. It was a fabulous trail lunch and we were glad Pitbull was able to join in the feast. Meanwhile, we also changed out our food and trash for our actual resupply, and refilled bottles with water that didn't need to be treated. We took kale, apples, and carrots for the trail and Pitbull was happy to take the same. While we ate we asked what she knew about the new fire whose smoke we had seen yesterday and today towards the east. It turns out that the fire was burning in the hills near their home. Fortunately, it was not close enough to be threatening their property and there were a ton of resources being used to fight it. We crossed our fingers for favorable conditions and quick suppression. We were so grateful she made the long drive for us, and she seemed happy to see us and play trail angel for the day. We later learned that she picked up another thru-hiker, Ninja Tortoise, on her way out and gave him a lift into Quincy. Her karma bank is full! We wished her well as we headed up the trail, headed towards the end of northern CA and bound for our next resupply in Truckee.